There are Many Button-Free Activities to Enjoy! We still have open volunteer slots and need your support to fill out the volunteer roster. See our new Volunteer Openings & Instructions page (updated daily) for a list. Thanks for your help !! Thanks to all who have already volunteered this year! We still need volunteers for some 10 PM and 11 PM slots, but your support has filled up the rest of the volunteer schedule. Thanks !! Come join us for First Night Chatham! We are a family-friendly, alcohol free, town-wide celebration of the arts with over 70 performances and events. 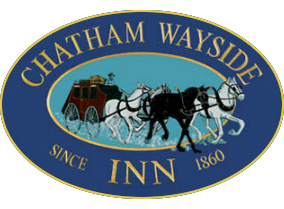 December 31st, 2018 will be First Night Chatham’s 28th New Year’s Eve celebration. 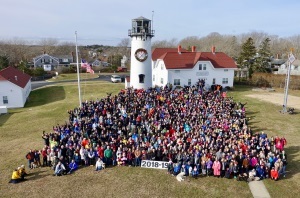 It’s a full day of fun and entertainment, starting with the Town Photo at the Chatham Lighthouse at Noon, and culminating with Fireworks at Oyster Pond at the stroke of midnight. From theme decorations to special entertainment to First Night's July 4th Parade display, we'll be going Country this year. The Town Photo is available!! Printed photos may be purchased at the Chatham CVS. To view the Town Photo online, with deep-zoom viewing that allows you see individual faces, see the Town Photo 2018-2019 page. Thanks to the Chatham Wine Bar & Restaurant, we will have Volunteer Appreciation Gift Certificates again this year, which will be awarded to some of our lucky volunteers at the Volunteer Thank-You Party in January. More detail on the Volunteers Page. First Night Headquarters has buttons, and you can buy “Will-Call” buttons online for another day. Visit the Online Button Store page to buy. Adult buttons are now $25 for the last three days of button sales. First Night Headquarters is now open, with buttons, programs, merchandise and information. 10am - 4pm Monday to Saturday; 1 - 4pm on Sundays. See the Headquarters page for more detail. New Venues pages display the schedule by venue. New Schedule Page displays complete afternoon and evening schedule charts. New First Night Mural page shows off the First Niight Mural that is in the Chatham Commuinty Center. New Press page for press info. New Connect page includes traditional contacts plus new Connect With Us! on Social Media. View First Night's Facebook feed without going to Facebook or having an ID. The First Night Chatham Committee needs your help running this year's event. The Committee has several open positions. We have added a page to the website describing Open Committee Positions. Please consider joining the fun and satisfaction of helping produce one of Chatham's signature events. While most volunteers work as Venue Volunteers, greeting patrons and checking buttons, we also need dozens of Specialty Volunteers who help behind the scenes, or work on a team led by a Committee member, to produce one of the First Night Special Events (such as children's activities). Please also consider helping in ways described on the Specialty Volunteer page.